While I try really hard to be a NUT FREE house, the Hubs and I are huge nut lovers. So when an awesome opportunity like Sant'e Nuts comes along I jumped on it. 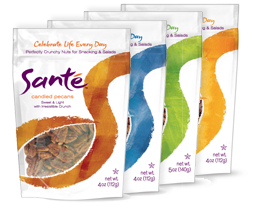 Sant'e Nuts was started by Sara Tidar after she became a single mom and needed to make ends meets. Sara learned a secret roasting technique from her grandmother, who roasted nuts in her tiny kitchen as a special treat. She continued the tradition , hand roasting nuts for her family. She felt good about giving them a healthy snack and the kids were crazy about them. 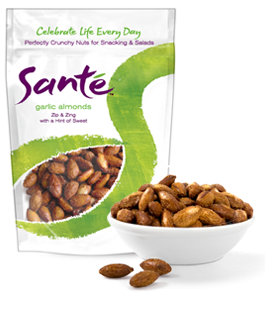 What makes these nuts so crunchy and tasty? The spice recipes use all natural quality ingredients. They buy only the highest quality nuts and they always roast by hand in small batches. They also use a secret technique that minimizes the amount of oil the nuts absorb during roasting process. * more nuts, less oil per ounce than other brands. I have to say I couldn't wait to dig my hands into these! I was sent an awesome sampler pack to try with the Hubs. Again I can't complain. They were HIGHLY addictive and I may have possibly ate this whole bag as well! 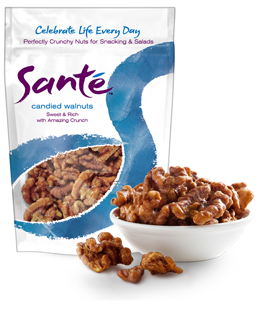 If you are a nut lover like we are you really want to give these a try. 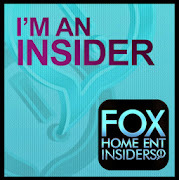 I can promise you that you will be hooked. We are already planning our order. 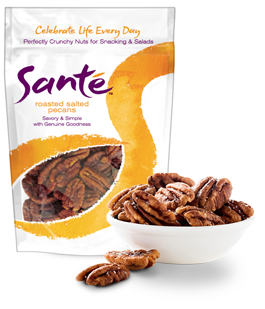 Speaking of orders Sante Nuts has generously offered ALL Party of 5 readers a special discount code. 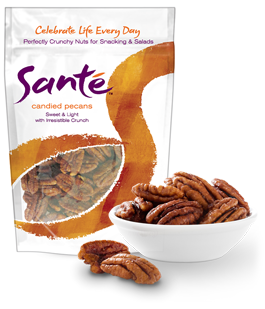 Just visit SanteNuts.com and enter 2011-Blog-085 at checkout to receive 25% off your orders good through December 16,2011 ! !